The advent of cheap solid state storage has been one of the most significant performance enhancements to hit the PC market in years, but the SATA standard has had a difficult time keeping pace with new product introductions. 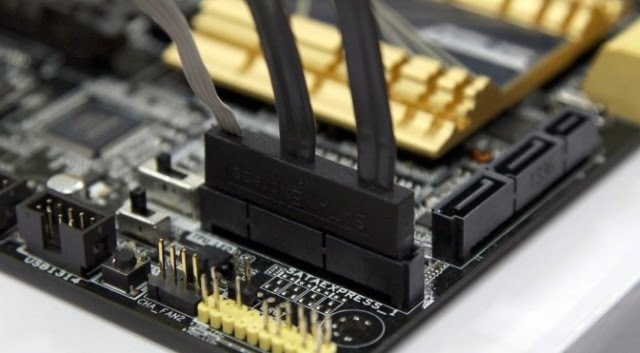 The new SATA Express standard promises to change that by combining the bandwidth of PCI-Express with a cable-based SATA-like connector that maintains backwards compatibility with the old SATA standard. SATA was originally designed to handle the needs of next-generation spinning disks. The earliest SATA controllers were essentially Parallel ATA (PATA) products with different cabling. Later SATA hard drives introduced the Advanced Host Controller Interface (AHCI), which offers support for features like Native Command Queuing as well as limited multithreading support and hot-swapping. AHCI, however, was explicitly designed to meet the needs of magnetic disks. As solid-state storage has proliferated, it’s become clear that the old standard was deficient in a number of key areas. Unlike hard drives, SSDs have sophisticated processors on board that handle everything from security to local memory management. 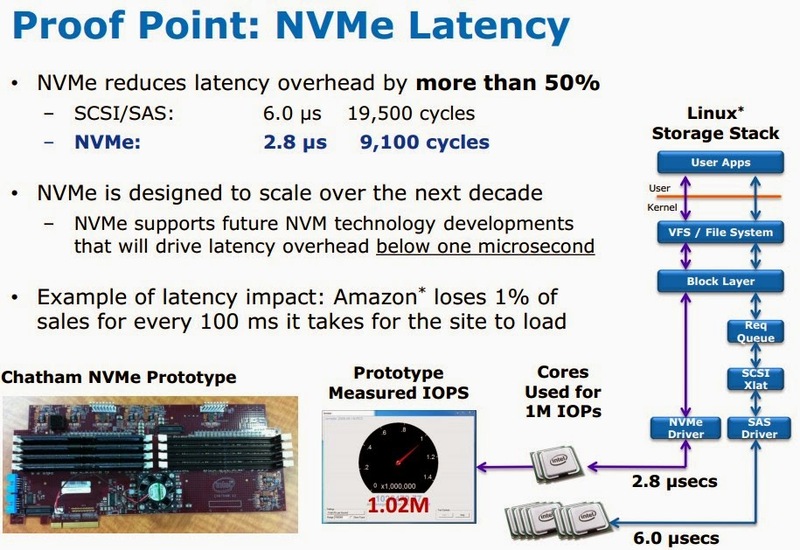 The new standard, NVMe, is something we’ve discussed before this is the protocol that will replace AHCI and offer superior performance at vastly reduced latencies compared to the old protocol. Along with that improvement in latency comes a massive kick in the pants for performance. SATA 6 tops out at 550MB/s, while PCIe 2.0-based SATA Express can deliver up to 800MB/s of bandwidth. SATA Express implemented using PCIe 3.0 would deliver up to 1600GB/s of storage bandwidth. This isn’t necessarily desirable at this point, as it would divert valued PCIe 3.0 lanes from the graphics card, but it shows the long-term scaling potential. This standard could allow for drives four to five times faster than the current top-end storage solutions available today, and it would scale seamlessly with future PCI-Express versions. Will the new standard be backwards-compatible? Yes, with appropriate plug interfaces. Exactly how this will play out is a bit muddled and will vary from manufacturer to manufacturer. The SATA Express standard supports both PCIe-based and SATA-based signaling in the same protocol and manufacturers are expected to create adapters that allow customers to plug current-generation SATA SSDs into SATA Express connectors. Current SSDs that plug into SATA Express ports will still use conventional SATA you won’t be able to accelerate a modern SSD by hooking it up to a SATA Express port. We’ll start to see controllers that support SATA Express this year and into 2015, but motherboard and shipping drive support remains questionable. As with SATA 6G, we’ll see edge support from third-party manufacturers first, with integration into AMD and Intel chipsets following a year or two later. With USB 3.0 and SATA 6G, the third-party controllers did a fairly good job, but Intel’s controllers still managed to wind up in the top spot, using the least amount of CPU time and delivering the highest level of performance. Performance tests performed by Anandtech show that SATA Express can deliver full PCIe performance over cables an impressive feat considering its early days for hardware availability. Do we need SATA Express in the first place? SATA Express is widely expected to find use in the desktop client environment; enterprise will be much slower to move (PCI-Express based storage is already entrenched ) and mobile already has the M.2 standard. As Kristian Vättö says, the value of SATA-Express when desktops already have plenty of PCIe slots seems limited. This is a fair point, so long as we’re only considering mainstream desktop form factors. The problem is, the future of the desktop market to the extent that one exists isn’t based in mainstream form factors. Intel continues to refine and polish its Next Unit of Computing. Gigabyte has new SFFs based on AMD and Intel platforms, as does Zotac. AMD pushed the A8-7600 out for its Kaveri launch precisely because it believes that 45-65W performance is the future of computing. It’s own next-generation Carrizo reportedly targets a 65W form factor. In other words, the market is moving towards system configurations with fewer and fewer PCI-Express slots. That doesn’t mean desktop workstations are going to cease existing there will always be a market for users who want a huge number of cores or maximum frequency but it means that the concept of “desktop” is getting smaller for an awful lot of people. This, in turn, suggests that SATA Express actually offers a way to use the PCI-E lanes on modern chipsets. It may never make sense for high-end desktops, but it could offer a way to squeeze PCIe performance into a mini-ITX form factor. 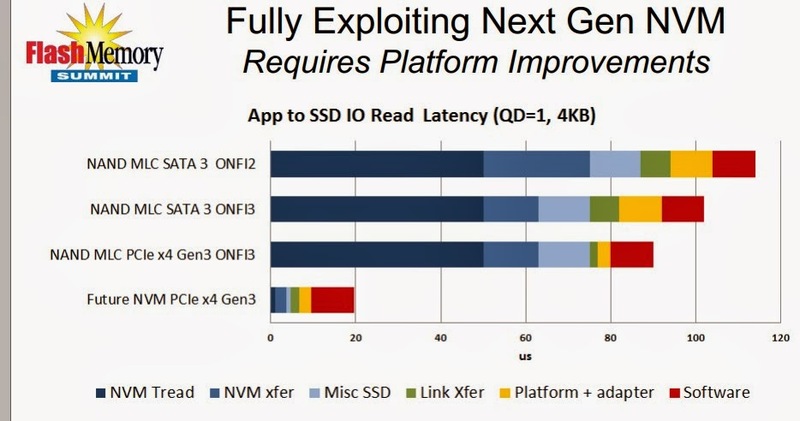 That’s where the new standard is likely to shine particularly if SATA Express SSDs sell at a lower price point than PCI-Express-based storage.